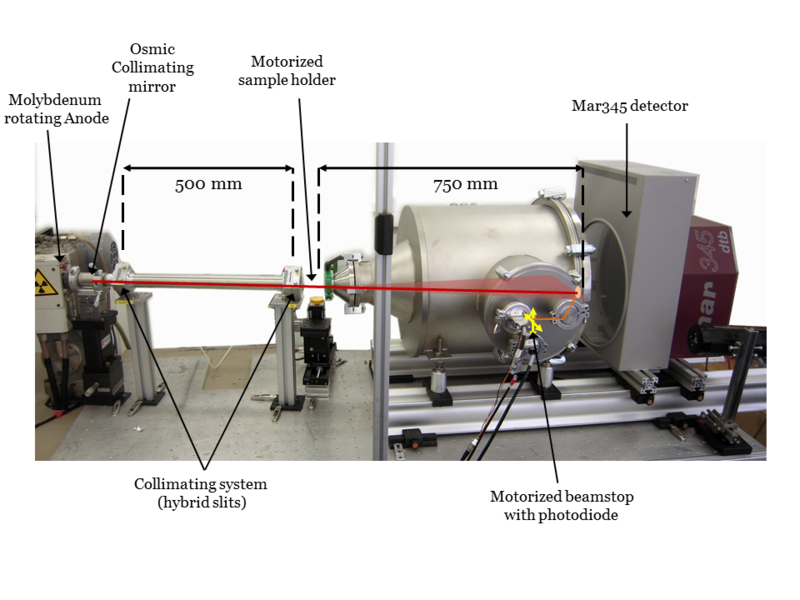 Momac is a Wide Angle X-Ray Scattering experiment, issue of a collaboration between CEA-LIONS and LPS-Orsay. The experiment is based on LPS-Orsay. LPS team is in charge of the X-ray generator, and LIONS team is in charge of the WAXS experiment. Funding was provided by the Triangle de la Physique in 2010. The experiment is open for the academic SAXS users of the RTRA, or industrial partnership. Beam time can be asked to Olivier TACHE (LIONS). LPS local contact is Benjamin ABECASSIS. SAXS technic is usefull for measuring properties of material organized at nanoscale. When exploring materials organized at nanosacle with SAXS technics, it is necessary to access to the Wide Angles (WAXS). A way to increase q range, is to reduce wavelength, and increase source Energy. Commonly Molybdenum (17 keV = 0.709 Å) is used as X-Ray source. 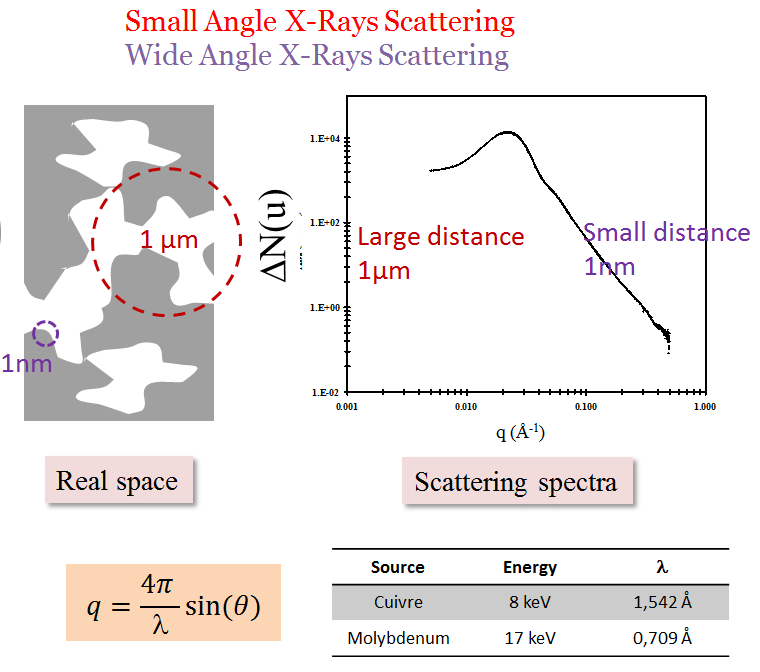 In SAXS, we measure the quantitie of x-ray scattered, wich is proportionnal to the incident flux, the surface of the sample, the transmission, the probality of being scattered ans the solid angle of the detector. We can observe that for a water sample, T.e is 6x higher for 17keV energy that for common 8keV energy. 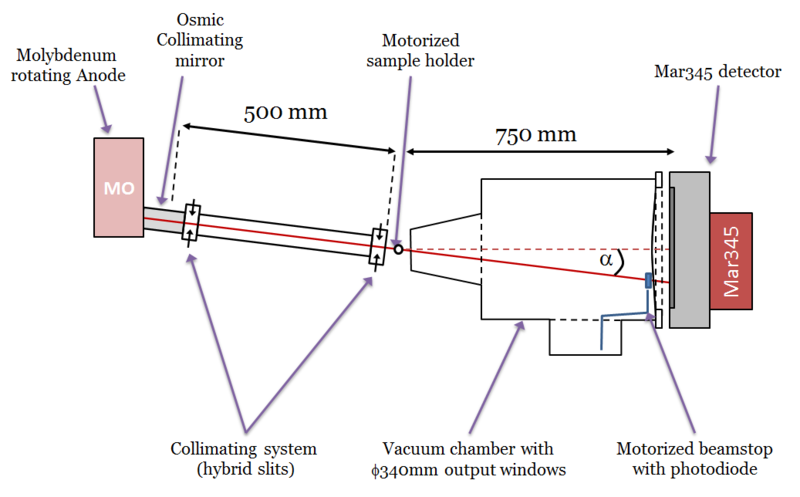 That means, that for the same indicent beam flux, the count rate on detector will be 6x higher for Molybdenum source. The experiment is controled by TANGO control command system. Python language is used for sequencing. Image data treatment is done with LIONS softwares (ImageJ plugins for radial average and pySAXS for data treatment).